I have a birthday giveaway to offer today, too! I started by inking Tim Holtz Distress Watercolor Paper with distress inks, then added some water splatters. I then die cut a slider element using MFT's Circle Spinner Channels. I colored the hedgehog and stump with Zig Clean Color Real Brush Markers and die cut using the coordinating Happy Hedgehogs Die-namics. I also die cut the Happy Birthday Die-Namics in white paper and stamped, white heat embossed the remainder of the sentiment onto the log. To assemble the card, I used dimensional adhesive on the back of the card panel and onto a white cardstock base. I adhered a MFT Spin & Slide Disc onto the back of the hedgehog with a penny and slipped it the track, and then glued the leftover piece of the slider to the white cardbase. So cute, right?!! So are you ready for the Giveaway Details?? Just a reminder that if you see something that is out of stock at the store, please click the "Put Me On The Waiting List" button so that Vanessa knows you absolutely need this item and can try to order more! Consider creating a Wish List, too! Oh my word...this is sooo CUTE!! Love it! Adorable card! Your no-line coloring is perfect! Not too long ago, I placed my first order with Butterfly Reflections. I will definitely do so again! I was amazed by how quickly I received my order! Outstanding card!!! What a generous giveaway!! Happy Birthday to YOu! I liked your Facebook page and actually just received my first order from butterfly refelection ink this weekend. Adorable card !The spinner adds ufn to the bold bg ! Happy Birthday to YOU!!! Karen, this is so incredibly fun!! Your coloring & your background are gorgeous- and that spinner!!! I had already liked your fb page & yes, have ordered from bri- loved how fast I received my order!!! Thanks for the chance & enjoy your day!!! Happy Birthday! Hope it's awesome. I've never placed an order with Butterfly Reflections Ink. New to them! The hedgehogs are so cute! Totally cute!!! 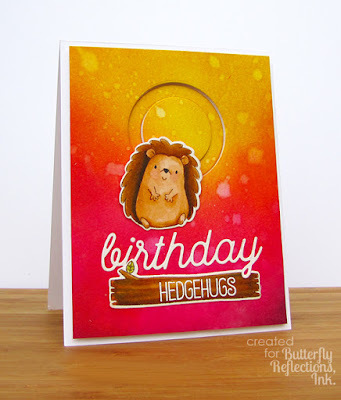 Love the colorful background you created and how the hedgehog spins!! Happy Birthday!!! I have placed an order with Butterfly Reflections before and was really happy with the speedy and friendly service!! I don't have a wish list set up though---should do that so I don't forget all of the many things I need (I mean...want). Love your adorable hedgie card! 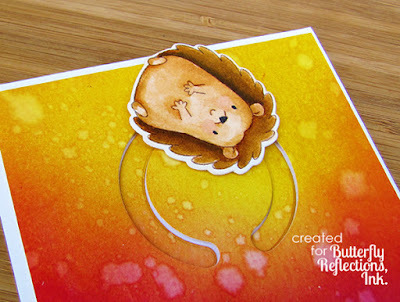 Great colors for fall, and a fun card with the Spinner Channel die! Happy Birthday, Karen! I am a new 'liker' to your FB page! And... I have ordered from Butterfly Reflections Ink! Very prompt service! What an adorable card! The spinner part is so fun! 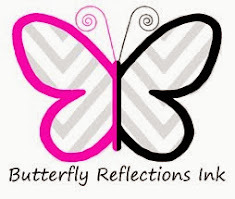 I am a new follower of your fb page too and yes, I've ordered from Butterfly Reflections before. I also have a wish list that continues to grow. Happy Birthday! Mine is next week, a week from today! Your spinner card is sooooooo cute and adorable! I love the sweet hedgie and your beautiful DI background! I like your FB page (Karen Garber) and, nope, I have never placed an order with Butterfly Reflections Ink. I have been following this blog for inspiration but have not placed my first order yet... I'm off now to create my wish list! Thanks so much! Maybe I'll have $15 to put towards my order! Hope you had a great birthday and got spoiled! Wow! What a great interactive card! I haven't put in a order yet...but of course I'd love to! This is absolutely adorable!! I love everything about it!! I just liked your FB page too. I have not placed an order with BRI before, but I will check it out right now. And Happiest of Birthdays to you!!! 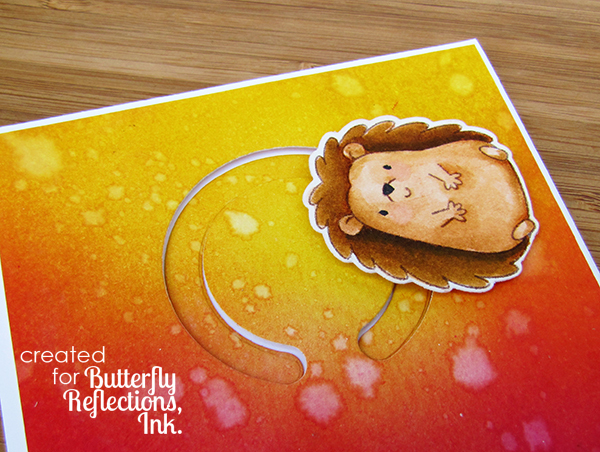 Super cute card and beautiful background you created, Karen! I've placed a couple of orders with Butterfly Reflections, they have excellent, fast shipping! What a darling card!!!! I have never order from Butterfly Reflections before in fact I have sadly never heard of them until today!! Oh my goodness. This card is so adorable! Love that it is interactive! Happy belated birthday! I have placed several orders at Butterfly Reflections Ink! Wow, your card is stunning and so playful, I love it!! So, I "liked" your page because for some odd reason I was unable to find a "follow" button... is this OK/count? As for having placed an order, I think I'll have to eventually file for bankruptcy with the number of orders I have placed! Vanessa is amazing-- wonderful customer service, kind and boasts an incredibly fast turn around time, which is especially nice for those like me that want instant gratification when it comes to my 'crafty mail'. Happy belated birthday, Karen!! Your inking is amazing with this cute hedgehog!! The interactive element takes this card up to another notch! You are such an inspiration is paper-crafting! ADORE your work! That's the cutest card EVER! Happy birthday Karen! I have bought from Butterfly Reflections before there was even a website! I need to buy more! Gorgeous ink blending and that spinning hedgehog just makes me smile! I love your cards! The coloring is awesome! I have not bought from Butterfly Reflections before but I am always willing to start! I have ordered from butterfly reflections ink. The,prices are great and shipping very fast!